Unwind in this well-maintained oceanside home in Salvo. Located in the quiet Hatteras Colony, Island Time is just the island-style getaway you’ve been looking for. Enter via the stairs from the carport at the back of the home, which lead up to a large screened porch, just right for relaxing in the cool afternoon breeze. The living area is colorfully decorated and comfortably furnished for spending quality time with family to catch a favorite flick or the big game. The adjacent eat-in kitchen features a wall oven and ample storage space. 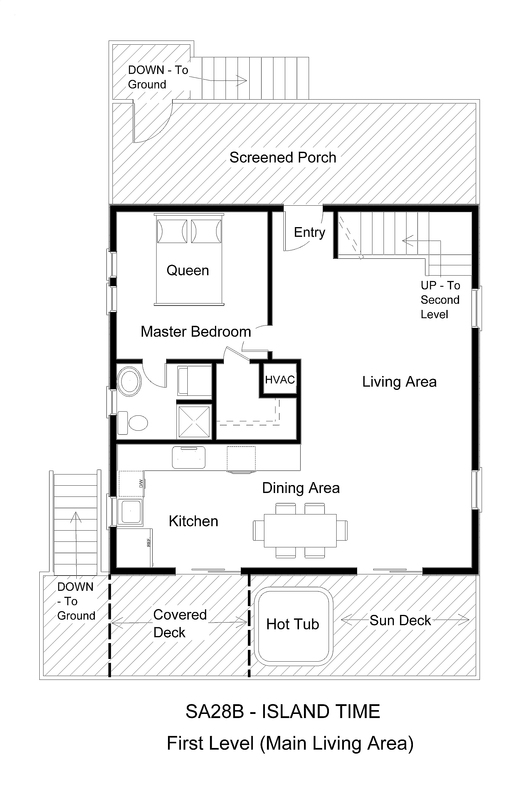 Let your cares soak away in the hot tub on the partially shaded deck off the front of the house. Sleep easy in the queen master bedroom off the living area, with a shower stall and convenient laundry area in the private bath. 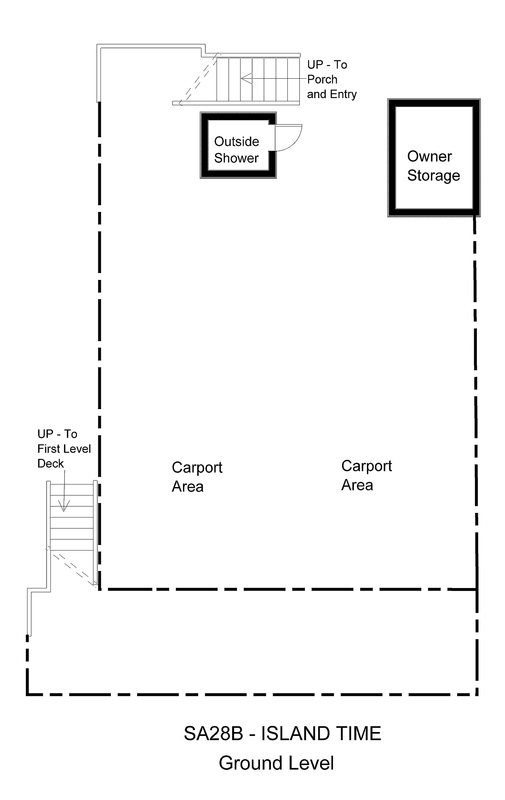 Upstairs, two additional bedrooms are located off the balcony overlooking the living area. 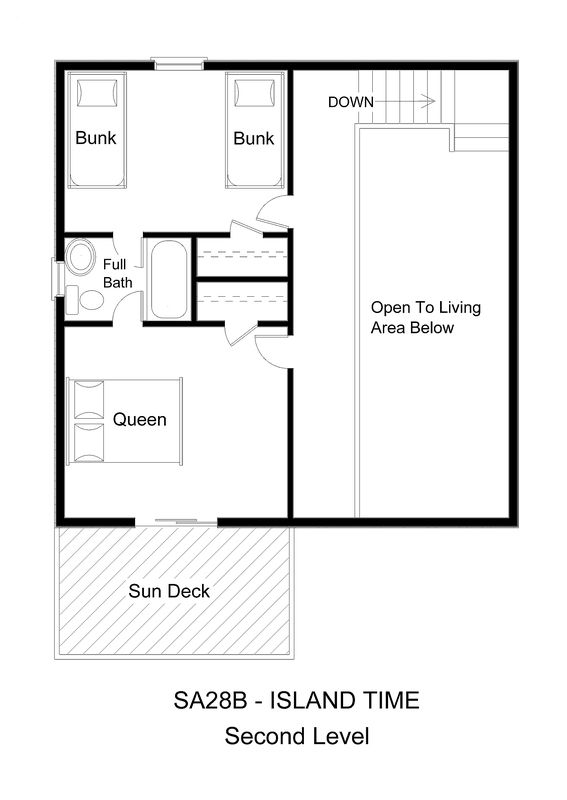 A bedroom with two bunk sets shares a Jack-and-Jill bathroom with a spacious queen bedroom with a private sundeck. All bedrooms have TVs so everyone can enjoy a little quiet time at the end of each exciting day. This classic OBX home is centrally located for whatever adventure you seek. Stroll or ride your bikes through the family-friendly neighborhood to the locally-owned ice cream shop, or hit the beach for surfing, sunning, and fishing just a quick walk away. Hop in the car for an easy 20-minute drive to Oregon Inlet, where you can enjoy world-class offshore or in-shore fishing charters. From there, the attractions of Manteo, Nags Head, and Kitty Hawk are all within easy reach as well. Head south toward Hatteras Village for even more fishing, 4-wheel-drive beach access, and shopping and dining sure to please even the pickiest palate. Board the Ocracoke Island ferry for an adventurous day trip. With all this and more waiting for you and your family, you’ll be living on Island Time for your next Hatteras Island getaway. We have rented homes in this area many time (just last year) and have 2 small well trained dogs (cocker & king Charles). Is this a pet friendly rental? This property is not one of our pet-friendly homes. Lovely home close to the beach. Reasonably priced. Great for two couples to enjoy and a few children. Kitchen is spacious. Deck and porch space is great! Pastel colors are soothing and beach decor is wonderful! The walk to the beach was not bad for us, but could be hard if traveling with small children. Island Time is a lovely property with lots of added features - games, puzzles, books, DVD's, hot tub, several televisions, Play Station, stereo, outdoor shower, porch, two decks, etc. The house is spacious and nicely decorated. Our family had a lovely time. There was easy access to the beach. There were many restaurants close by. The grocery store is approximately 20 minutes away. Our family would definitely choose to stay here again!